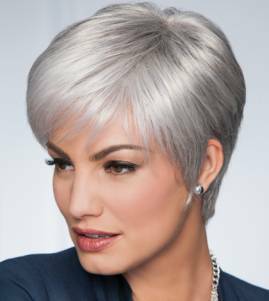 At Head Complements, our collection comprises over a hundred different styles of wigs and hairpieces, both synthetic and human hair. This range for women reflects the latest in overseas fashions. Our wigs and hair pieces are sourced from suppliers worldwide, including Eva Gabor and Raquel Welch. 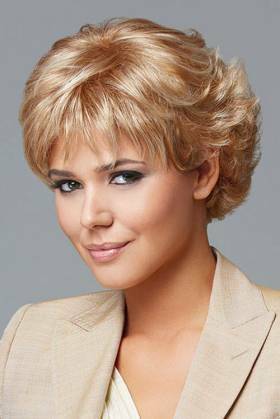 Our range encompasses monofilament wigs, fully machined wigs, hairpieces, hair extensions and toupee pieces. The wigs shown here only represent a small sample of our collection and are shown here purely to give an indication of our styling and typical pricing. Click on any of the smaller images on the right hand side to take you further down the page to see a larger image as well as a description and price. Our customer base is eclectic: we cater to women who are undergoing medical treatment including chemotherapy, women with thinning hair (male pattern baldness) or alopecia, as well as those wanting to explore fashion, theatrical and bridal options. 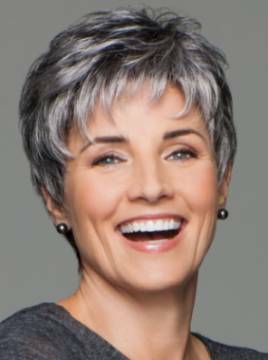 The increase in overseas travel for baby boomers makes wigs an ideal option for ease of travelling on cruises and during beach holidays when constant hairdressing may not be an option. 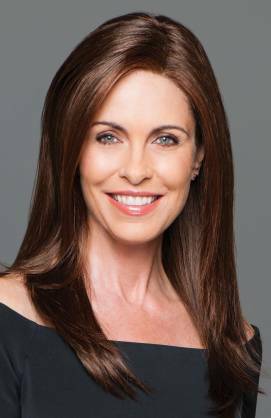 Head Complements is not an online shop - our business is to provide a consultation to assist you in selecting the best possible wig or hairpiece and ensure a perfect fit. Such a consultation may take up to an hour. Please call us with any questions you have. 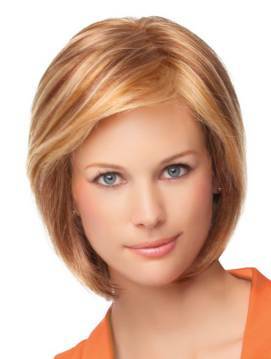 Our range of wigs is extensive and is sure to please the most discerning customer. We stock short styles in curly, spiky and ultra-straight, bobs, shags, mid-lengths and of course, below the shoulder styles. Many styles reflect the current salon trends with razor cutting and asymmetrical cuts. Our wigs also come equipped with features which are an improvement to the previous generation of wigs: these include hand-tied baby hairs around the forehead, extra fine denier used in the hair fibre to ensure lightness, silicon points inside the wig for greater security and grip, as well as the clever use of colour to simulate natural hair re growth - all of which assist to make your wig as natural-looking as possible. A new colour palette has been recently introduced featuring wigs with a darker colour at the root in line with recent fashion. This series is in addition to our present range of multi-tonal shades, highlights and lowlights - all of which provide a natural look! Our range offers ultra-petite (20”) head fittings through to large head (23”) fittings. This measurement is the circumference of your head from the top of the hairline to the back of the nape. The correct fitting of a wig is crucial to a natural look, comfort, and security. Head Complements also offers an alteration service for varying the size of your wig for a more dependable fit. This service is free for wigs and hairpieces purchased at Head Complements. We also carry a range of heat friendly wigs. The very soft and natural looking fibres of heat resistant wigs can be blow-dried, shaped and individually styled just the same as real hair. However the style will stay intact even after you wash it, and will not change until you have re-applied heat in the form of flat irons, curling wands or blow dryers. Additionally, the heat resistant fibre looks more natural than conventional synthetic fibres, and in many ways closes the gap between synthetic wigs and human hair. If you have been medically diagnosed with alopecia, you may be eligible for a subsidy for up to $240 towards your next wig or hairpiece. Ring SWEP (the State Wide Equipment Program) on 1300 747 937 for an application form today. This application must be accompanied by a quotation, which we are happy to provide. Prices start from $220 for our synthetic wigs and from $1300.00 for shoulder-length, human hair wigs. A full, barely waved top with short, textured layers in on the sides and back. This is a fresh, sophisticated cut. This short, smooth bob features a full fringe and sleek, chin-length sides that are angled cut to blend with a short, neck-hugging nape. A shoulder-length style that's layered and choppy. A fresh take on the classic fluff-back silhouette, this short, barely waved cut includes a hand-knotted top and sheer lace front for natural looking off-the-face styling. A versatile page cut; lace front allows the options of fringe or no fringe. All over precision tapered layering turns a classic boy cut into a sassy silhouette. Ultra straight styling with precision tapered ends add a new dimension to the classic page. The monofilament part provides a natural contour on top. Silky, shiny and straight. With a hand-knotted monofilament part for varied parting options and a sheer lace front for natural, off-the-face styling. This subtly layered and expertly tapered chin length page includes a side swept front with sides that angle up to a short nape. Under 55 gram in weight, this light, little pixie cut features razor-like tapering of barely waved layers and is very easy to style. 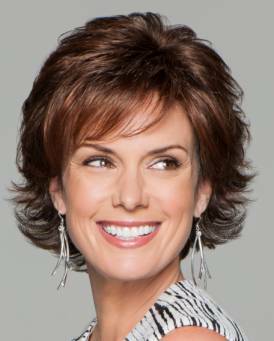 A feminine bob with a monofilament part, sporting soft, loose layering. Oodles of softly curled layers add feminine appeal to this below-the-collar shag. Long, face framing layers with monofilament part and lace front. Long, layered style with side, monofilament part. A lightweight, yet resilient style-this attractive boy cut features ample length in the top and crown that beautifully blends into a layered back and tapered neck. This timeless fluff resurfaces with a contemporary touch. Soft layers in the front and side blend to an easy-care, brush-up back. This barely there, easy care fashion cut includes a hand-knotted top for light, cool comfort and a sheer, scalloped front for a natural looking hairline. Wear it tousled or tailored. A short, smart cut with longer fringe and monofilament crown. An easy, sporty model that is fuss-free. Comes with a mono crown and lace front for a natural looking hair line. Short, barely waved, all over layers mean this stunning, no fuss salon cut can be worn full, smooth or somewhere in between. 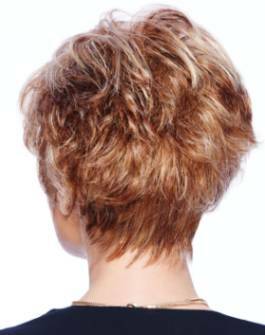 Short, face framing cut with textured layers throughout the back.